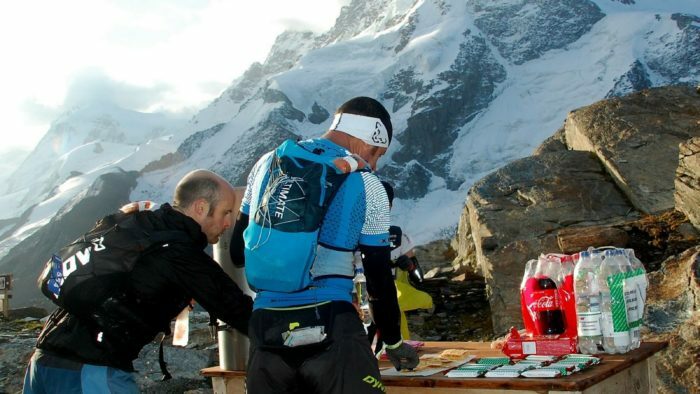 Home » Features » Iconic Races » Ultra Tour Monte Rosa – The Most Beautiful Race in the World? 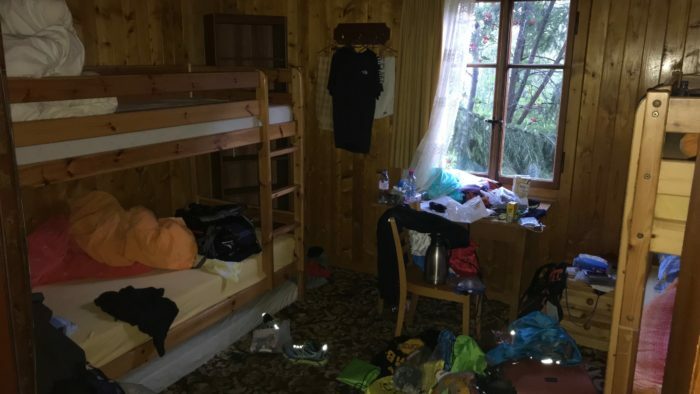 Ultra Tour Monte Rosa – The Most Beautiful Race in the World? I’ve often thought there was a place for a full race service – a concierge type approach – where you decide the race, and someone else sorts it all out for you. 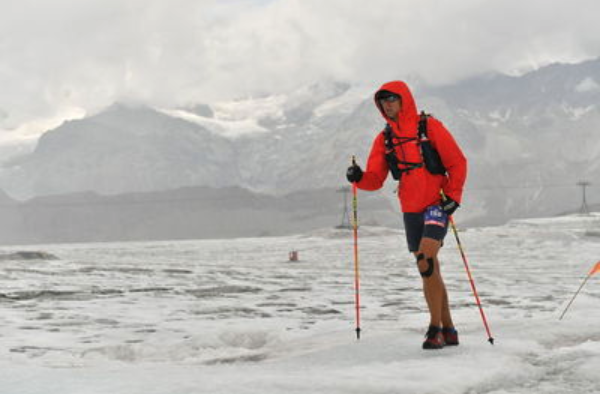 Step forward Ultra Tour Monte Rosa! 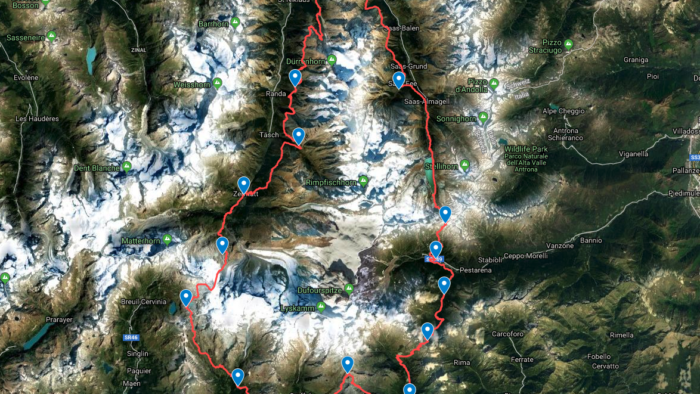 The Ultra Tour Monte Rosa is a 170km (maybe 180kms) route around the Monte Rosa massif, circling 29 4000m peaks, with views of the Matterhorn and many other beautiful, inspiring mountains. 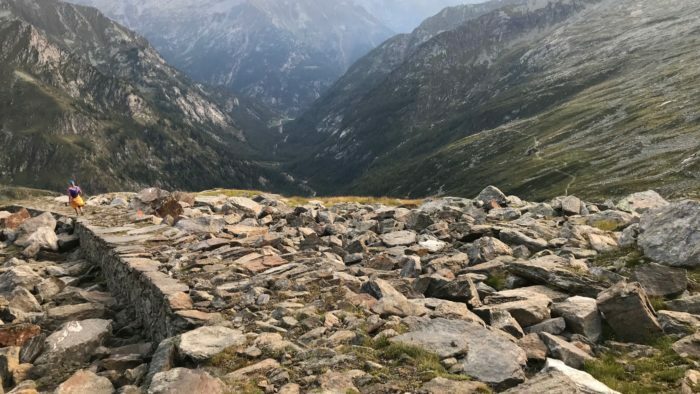 It’s a hard, technical route that takes in over 11,000m of ascent and take runners down valleys and up and over 3000m passes in a big loop of the Monte Rosa massif. The organisation for this race was superb. Lizzy and Richard provided a full service; from initial place acceptance, they then organised bus or car transport from the various airports to the start / finish in Grächen and also offered to arrange budget accommodation for those that wanted it and provided emails and text messages reminding people about mandatory kit. I had a hotel room booked but cancelled and went for the dorm room option just to make it more authentic. In hindsight, this may have been a bad idea. I don’t like a top bunk at the best of times, but after 170kms, it’s an unwanted challenge getting up and down the ladder. The race itself is unbelievably good. Conceived by Lizzy, and described as “Majestic mountains, wild high passes, spectacular valleys, remote hamlets, traditional villages, flower filled meadows, leafy forests, mountain tarns, demanding ascents, breath taking descents and miles and miles of superbly runnable trails – the UTMR promises you a journey through an amazingly diverse landscape, through a region rich in history, culture and tradition.” It’s a monster of a course, but also incredibly beautiful and rewarding. Sounds easy right? Well, let me tell you…! The first challenge was sorting out 4 drop bags. It was a logistical challenge to start with, but in a shared dorm with 3 others doing similar… this was a bit of a nightmare. It turned into a bit of a ‘cup game’ routine with me constantly forgetting what I’d put in which bag, and where was that long-sleeved top again? Once we had started (at 4am I should point out), the next challenge was ‘goat man’. With a bell tied to the back of his pack, he was quite literally bleating every few minutes as we hit the trails outside of Grächen. I’m all for being a mountain goat, but honestly… I had to get away from him. The longest suspension bridge might be famous for its length, but it is a flippin nightmare to run / walk across – it has a horrible sideways wobble to it that makes it feel very much like it’s going to throw you off it the whole way across. First drop bag stop at Zermatt 40ish kms in, and things were going well. Few little aches already but nothing major, and some lovely, lovely trails to run on with the most amazing back drop. I was quite surprised to see I had some useful things in my drop bag, but I had huge food envy seeing the rice pudding and baked beans Nicky Spinks had in her bag. All of a sudden, my Chia Charge bars seemed very unappealing. Unfortunately, it would remain that way for the rest of the run. The next section had a glacier crossing on it and was pretty high up in the hills, but with the weather being perfect blue sky in Zermatt, I decided to stay with what I had, and not upgrade to the full cold weather (and heavier) kit I (remarkably) had in the drop bag. Up we went, past the next check point which was literally a table on a mountainside, and onto the glacier. Turning the corner to the glacier was like walking into a particularly fierce freezer. Very exposed, hail, cold wind and no visibility meant a rush to put on gloves and jackets and get moving across the white frozen bit. 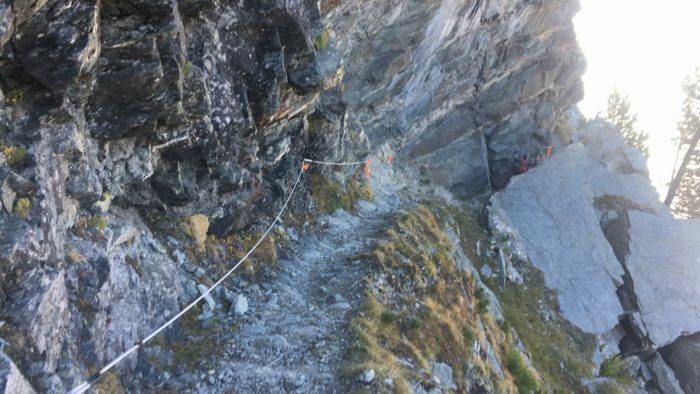 Despite being a tad uncomfortable, this bit was ace – I think every race should have a glacier crossing as part of the route – it certainly gets the blood going thinking you might fall into a crevasse at any moment! 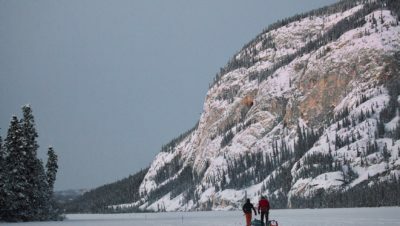 (the route had been very well marked by the mountain guides that morning, there was very little chance of falling into a crevasse unless you went horribly off course). The next challenge came in the form of altitude. After the glacier we headed up to the highest point of the course, the Theodul pass, at 3300 odd metres I started to really notice the lack of air. I was more knackered than usual, struggling to breathe and move up with hill without getting a bit dizzy and having to stop for a little rest every few minutes on the ascent. Quite a relieve to get to the top and start the decent, which was great fun until it started to really rain hard and turn a nice rocky path you could trust your feet on, into a muddy, slippery quagmire that you could not. Picking my route carefully through the muddy trail, the miles rolled passed slowly throughout the day. My plan of ‘taking it easy’ for the first half was working out well. At it started to get dark, I descended into Gressony, and ‘not quite half way’. After half an hour of ‘what’s in the bag?’ (I’m sure I put the t-shirt / food / new shoes in this one??! 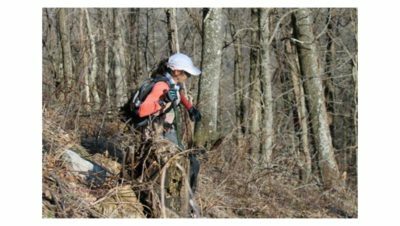 ), it became apparent that trying to eat pasta, soup or any kind of checkpoint food was also going to be a challenge. I’m usually pretty good at eating proper food on a run, but this time I really struggled to swallow anything solid. This did not bode well for what was coming up. We’d been told it was likely to be very unpleasant up the top here – driving wind and snow was forecast, so I had borrowed some cling film from the checkpoint to put over my gloves that had got soaking wet earlier. Thankfully the conditions were better than the forecast, so I never got to try out my ‘special’ gloves. Up, over and down we ran, losing 900metres to the next checkpoint in a quad busting descent that also kept on giving… quick stop at the checkpoint, and then back up another monster climb up and over the Colle del Turlo. This follows a bonkers ‘paved’ path that goes pretty much the whole way up and down the pass, for 20kms and 1500 vertical metres. Half way up here a headtorch appeared from the bushes, freaking me out a bit (the hallucinations had not started in earnest yet) but providing some welcome company in the form of Sarah Hansel, who had been trying to have a sleep in the hedge. We’d chat and run within sight of each other for most of the rest of the race, despite her walking being the same my running pace. The next, and last ‘big’ – 1500m – climb was up to the Monte Moro pass, the statue of the Madonna, and the best aid station I have ever some across on a race. 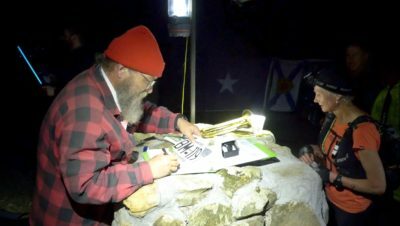 Here they had everything from masseuses to apple strudel, via coffee, many different (and very edible) foods and some ‘trail mail’ messages from friends, all laid on by the On Running team who were running the station. Caught in a pickle between being desperate to finish, and desperate to stay and enjoy the hospitality, I made do with an extra bit of apple strudel and headed out and off down the hill to Saas Fee. I loved this bit and ran as fast as my ‘saved something for the second half’ legs would go. 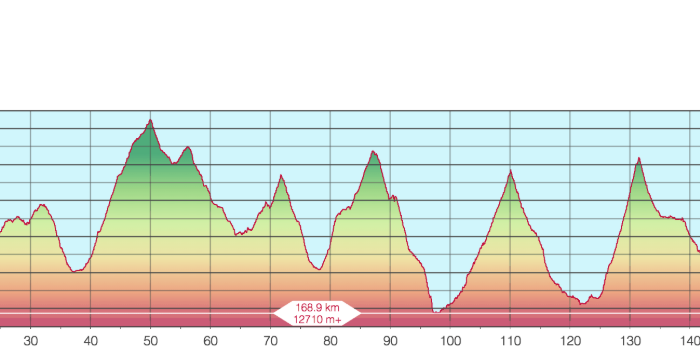 Looking at the splits, I ran this section faster than the winner… admittedly it was mostly downhill, but I enjoyed it immensely until the last the last section from Saas Fee to Hannigalp, when the wheels would well and truly come off. Just 20km they said. It’s undulating they said. I wish I could do this section justice, but I really can’t, aside from that this was the hardest 20km I’ve ever run, and it would take me the best part of 5 hours. By now I was in a bit of trouble, I was hallucinating all over the place with seemingly every stone, rock or tree taking on a face or shape that was clearly not right. Elephants in the alps? Unlikely. I was tired, it was getting dark, I was stumbling a bit, still dizzy with the altitude and struggling with the uphill sections and starving hungry having not eaten enough and forgotten to top up my food supplies at the last drop bag. The path here is exposed single track, running along the side of a cliff with a steep and big drop off on the right hand side. Clinging to the side of the mountain, trying to keep up with the people in front of me so if I did go over the edge, at least someone would see me go, it was desperately hard work to stay focused and not start crying! As I was overtaken by the people I’d pushed hard to overtake on the previous downhill bit, I had a moment, pulled myself together and tried even harder to keep up with them so they could drag me home. The finish is very low key at 10pm, with most sensible folk elsewhere on a Friday evening. But crossing the line to be greeted by Lizzy and Richard with a medal, a Nepalese prayer scarf, a bowl of lovely chilli hot soup and a chair, was still quite emotional. I’d set out to secretly finish in the top 20, and although I missed that finishing 23rd out of the 150 starters, I’m chuffed to bits with the run and very glad I could stop running after 42 hours and 10 minutes. It’s the most amazing race, jam packed with beauty, some big, big climbs and amazing mountains. Despite being so vast in scale, the race has a real intimate feel to it and with a field of only 150 people, the attention to detail for each runner is incredible. It’s a beast of a run, but one I’ll never forget. Find out more about the race and how to enter next year here.